WORKS OFFLINE - Expand your Spanish vocabulary or find just the right word for the assignment, our comprehensive word selection and simple search options will have you using this app every day. With a minimalist display designed for functionality it features visual cues, like usage guides and regional flags, and easy navigation between detailed results. One of the largest collections of synonyms and antonyms featuring pronunciation, it includes not only single terms but phrases and complete colloquial proverbs. This wide-ranging collection of terminology is intended to be a professional writing aid for native speakers and a reliable tool for those learning the language. Internet connection needed only for spell checker. 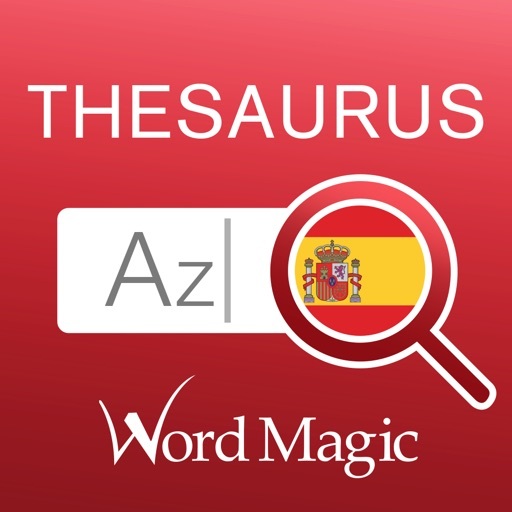 What makes this Spanish Thesaurus unique? • The fact that you may obtain synonyms of parts of speech usually not included in other thesauruses, such as exclamations, prepositional phrases and idiomatic verbs. Even proverbs have their synonyms! • Vast database; no less than 1,329,000+ synonyms and 443,000+ antonyms. • 272,000+ words and 29,400+ images. • Meaning Descriptors to help distinguish between the different word meanings. • Strict coherence of each synonym set. Transitive verbs yield only transitive synonyms. Intransitive verbs yield intransitive synonyms. Meanings and connotations of words are never mixed. • Four incredible New premium Spanish voices! • You may enter now plurals or feminines as valid entries. • Fuzzy Search: Detects misspelled words and offers close suggestions. * Please note this is a Thesaurus and therefore includes only Spanish synonyms, no translations nor verb conjugations. Our General Reference Dictionary includes all those.